Does Tim Sloan's retirement give investors the "all clear" when it comes to Wells Fargo and its recent scandals. This bank has drastically underperformed its peer group and the broader market since 2016. 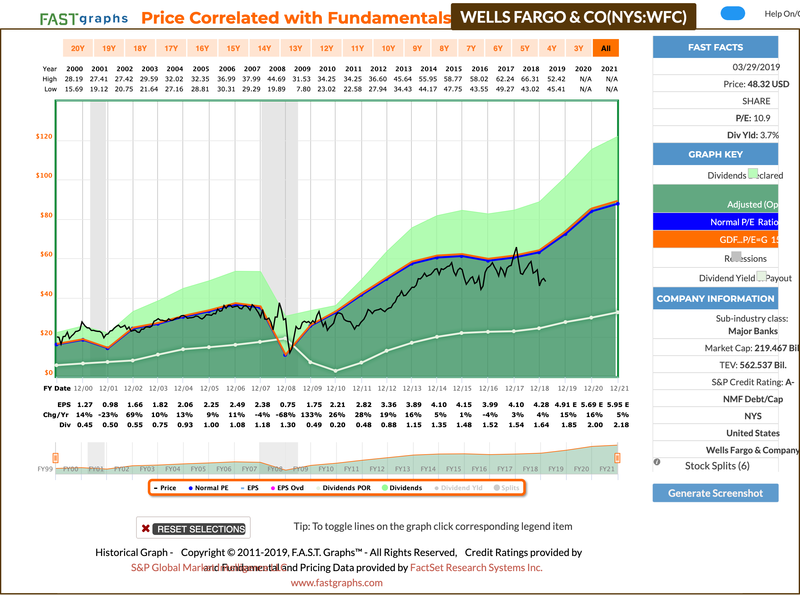 Does the value that WFC shares present outweigh the risks of owning big banks as a dividend growth investor? For years now, Wells Fargo (WFC) has been sitting in the penalty box for me. I used to own shares of this company, believing that it was the best in class big bank; however, when its scandal struck in 2016 I quickly unloaded my shares because in general, I’m someone who thinks that there is never just one cockroach in the cupboard and I’m better off being safe than sorry with my investments. The market has maintained very negative sentiment towards WFC ever since the company’s issues became public. Wells Fargo has been in the news ever since due to congressional oversight and restrictions put on the company by the Federal Reserve. I was surprised back when CEO John Stumpf stepped down as chairman and CEO in response to allegations of misdeeds, that Wells Fargo replaced him with a candidate from within the company. I had already sold my shares at that point, but when that news hit the headlines, I couldn’t help but think that Tim Sloan, his replacement, would be forever tainted and wouldn’t be able to remove the dark cloud that was now hanging over this once illustrious company. Well, Mr. Sloan announced his retirement last week and now I’m beginning to wonder if it’s finally time to think about buying shares of Wells Fargo again because with new, presumably outside leadership, the company can finally turn itself a new leaf. There are two primary reasons that I’m interested in owning shares of Wells Fargo in the present. One of them is value. I sold my shares for $45.40 back in September of 2016, locking in ~13% profits (plus 3 years’ worth of dividends). At the time I was happy to take profits since the stock had a stain on it. Since September of 2016, WFC’s share price has increased by just ~6.5% while the S&P 500 (SPY) and the Financial Sector Spider (XLF) have both posted gains of ~33%. This relative underperformance is exactly what I was predicting when I sold. And now, ~2.5 years later, I’m starting to wonder if it’s time to attempt to capitalize on these divergent trends. As a value investor, I’m constantly trying to take advantage of mean reversion. After recent weakness, WFC is trading for just 10.9x ttm earnings while its long-term average P/E ratio is 14.7x. The stock is even cheaper on a forward basis. Analysts expect WFC to post 15% earnings growth in 2019, 15% in 2020, and 5% in 2021. Looking ahead to these potential figures, at its current $48.32 share price, we see that WFC is trading for just 9.8x 2019 EPS estimates and 8.5x 2020 EPS estimates. Obviously, it’s risky to look so far ahead. This is especially the case in the financial industry when so much of these earnings are based upon macroeconomic factors and interest rates, neither of which can be accurately predicted looking out a year or so. However, while exact estimate cannot be counted on, one trend is clear: barring some sort of unexpected macro-economic slowdown or more negative news being uncovered on Wells’ operations, it looks like this company’s operations finally appear to be headed in the right direction. While I said I was worried about Tim Sloan being tainted by his past, it’s worth noting that this was more of a guilty by association situation more than anything. I think Sloan did a fairly good job controlling the things that he could control as CEO. In WFC’s recent earnings call, Sloan highlighted consumer-focused initiatives, like fee waivers for those affected by natural disasters and nearly 40 million notifications that the bank sent out to help its customers avoid overdraft fees. He noted that these initiatives did hurt revenues, but obviously WFC is more interested in customer service than squeezing out every penny of earnings. Optics matter for multiple expansion at this point in time. And it appears that these optics are helping. WFC reported that purchase volume with its debit and credit cards were up 8% and 5%, respectively, compared to the fourth quarter a year ago. Auto loan originations increased 9% y/y. Home equity was up 14%. Small business was up 19%. And, student lending was up 16%. A lot of this has to do with a generally stronger economy, but the fact that WFC is posting growth shows that it is not losing major market share due to a lack of customer trust. Much of the recent conference call was dedicated towards conservative management practices and efficiency measures that the company hopes to take while it re-invents itself. In 2018, WFC’s free cash flow figures were way up (they basically doubled from ~$18b in 2017 to ~$36b in 2018). Rising rates played a role here as did operational growth associated with a stronger economy (increased deposits and growth in the loan portfolio). Also, reduced headcount is playing a significant role. Management cut jobs in 2018 and they’re expecting to see another 5-10% reduction moving forward. Management recognizes the shift to digital (ATM and teller transactions are declining) and continues to revamp stores and invest in technology, automation, and cybersecurity to ensure that this bank can compete in the environment of the future. I’m happy to see that WFC is investing in itself. I think the financial industry is ripe for disruption moving ahead. Last year we saw bitcoin in the news and blockchain was all the rage. More recently, we saw Apple (AAPL) make a major entrance into the credit card space. I’m not sure how it will play out, but I imagine that technology will continue to reshape the financial industry and if the banks don’t evolve and adapt, I could see some of the old school names we’re accustomed to seeing in the banking sector going the way of the dodo. Thankfully, this management team doesn’t seem complacent and what’s more, WFC’s valuation is so cheap already that I think any risks that unforeseen disruption or lower margins due to increased competition from new technological players would have relatively less impact on WFC’s multiple. In other words, worst-case scenarios have already been priced into this name and I think the path of least resistance here, in terms of which direction the multiple is going to head in the short-term, is upward. When making value investments, investors are relying on mean reversion. As previously stated, WFC is currently trading at a steep discount to its peers and its historical multiples. As we move away from the scandals, I think the mean reversion process will begin to play itself out. And thankfully, investors who agree with this sentiment can be paid a handsome sum to wait. Right now, WFC yields 3.7%. This is well above the yield offered by the SPY, the XLF, and U.S. Treasuries. I believe the yield is safe (in the short term, at least). So, what’s not to like about that? So, with that in mind, the other reason is impressive shareholder returns. This company returned $25.8b to shareholders in 2018 and I wouldn’t be surprised to see that total increase this year as shareholder returns appear to be accelerating. In the fourth quarter, for instance, WFC returned $8.8b to shareholders, which was double the amount they did a year before. WFC’s dividend increases were very slight in the couple of years immediately following the scandals (2.7% in 2016 and 1.7% in 2017), but in 2018 the company raised its dividend by 6.5%, which is an impressive raise for a company with such a high yield. Now, the problem with big banks as dividend growth investments, no matter their yield in the present and their recent dividend growth histories, is the fact that they’ve had historically tough times raising (or even maintaining) their dividends during economic recessions. During the Great Recession in 08/09, WFC was forced to cut its dividend (in the Spring of 2009, Wells slashed its $0.34/share quarterly payment down to just $0.05/share). It wasn’t until 2014 that WFC’s quarterly dividend increased back above that $0.34 level. And sure, today, WFC’s quarterly payments are sitting at $0.45/share, so the long-term trend is still an upwards one. However, I’m not a fan of putting my income stream at risk like that and losing out of ~4 years of growth/compounding makes a pretty big difference when you’re thinking about where you want your income to be a few decades down the road. I do think that the restrictions put on the banking industry since the Great Recession have significantly strengthened their balance sheets to the point where it’s much more likely for them to be able to weather a financial slowdown in a way that is more acceptable to me as a DGI investor. However, I’m in the “I’ll believe it when I see it” boat when it comes to the banks raising dividends through a recession. The value is apparent in the financial sector as a whole. The banks have lagged with other cyclical companies (and entire industries) risen in recent months, adding to this value on a relative basis. If tax reform has indeed sparked sustainable growth in the economy and staved off recessionary fears for another few years, then the big banks could turn out to be fantastic investments in the present. However, the banks are going to want to see rates increase for this to happen and right now, it appears that the Fed believes that further increases would harm the economy. I don’t know what will happen as far as rate increases go. I don’t know when we’ll run into the next recession. But, what I do know is that the banks remain too sensitive to broader economic forces and I’m content to look elsewhere for my dividend income. There is simply too much risk associated with the banks and I’m not interested in adding exposure at this point in time. However, I do believe that the change of leadership, the prospects for the asset cap restrictions coming off the books in late 2019/early 2020, and continued high levels of shareholder returns in the short term could make WFC an intriguing value play for someone who isn’t as focused on income safety as I am. As always, I’m looking forward to hearing everyone’s opinion. Until next time, best wishes all! 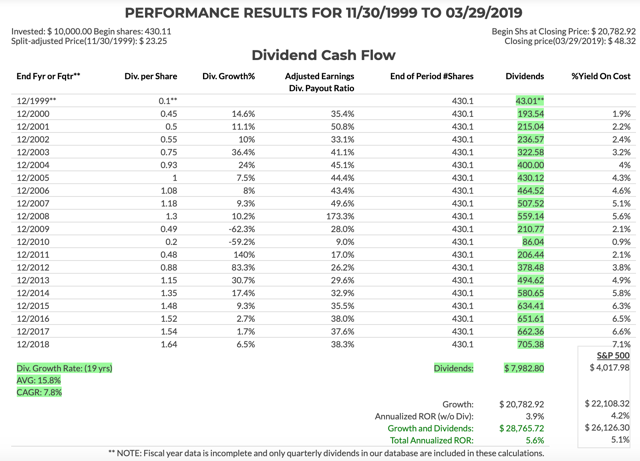 The article was previously published for members of The Dividend Growth Club. DGC members have access to sample portfolios spanning different dividend yield thresholds, weekly Nick's Picks articles, highlighting the best DGI values I see in the market, real-time access to Nick's Portfolio and trade updates, and a vibrant chat room where an income-oriented community has come together to share ideas.